Wait. We think we need to rethink the whole black cat myth. Maybe it's bad luck to cross a meezer's path too. Just meowin'. Uh, and if anyone asks, we prefer Extra Crispy. The Hubby and I will NEVER forget how Sweetie stole a raw chicken drumstick from the back deck, while he was preparing to grill. She'd had her kittens, but we hadn't seen them yet. The drumstick caper was proof that she had babies, and we really couldn't be mad at her. She's a little cat, and the sight of her with that drumstick in her mouth will always cause me to laugh. And, Kentucky Fried Chicken is supposed to be the BEST bait food when trapped ferals. I have no proof, since I use tuna or salmon. Thanks for sharing your Toon Tuesday Drawing. 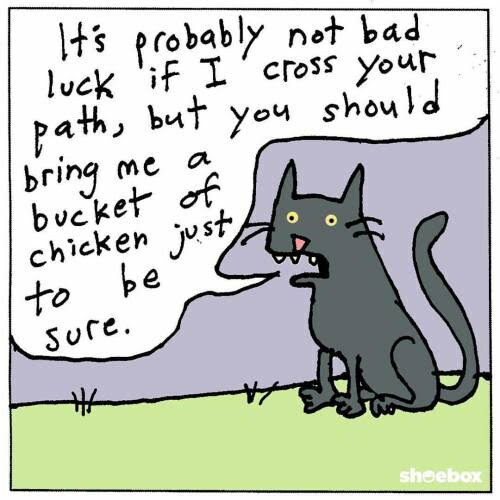 We hope that myth about black kitties being bad luck is done and over with. But now you had to say chicken and I can hear my belly growling. Hope your having a great start to the week. MOL! I like this idea.